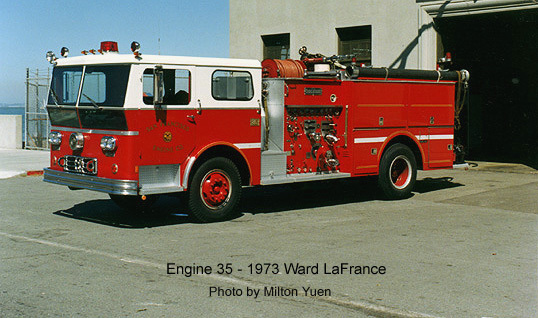 Ward LaFrance P-80 with factory number 80-883 is shown here as Engine 35 at the Embarcadero Fire Boat station is one of the 16 Ward LaFrance pumpers I delivered to SFFD and put in service back in 1973 to 1975. This rig is no longer in service as of 4/99. 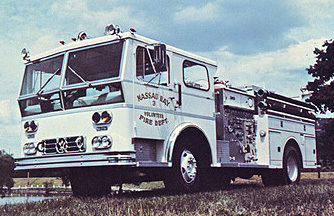 Nassau Bay Texas, Engine 3 is a typical Ward LaFrance P-80 triple combination C.A.E pumper with Ultra-Vision cab. 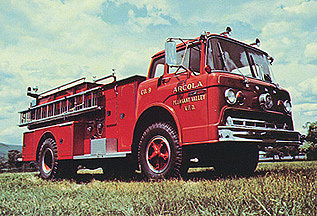 These were available with the standard Waukesha FG-817 145-GZB 817 CID 280HP six cylinder gasoline engine or a Detroit or Cummins Diesel engine and with a manual or automatic transmission. 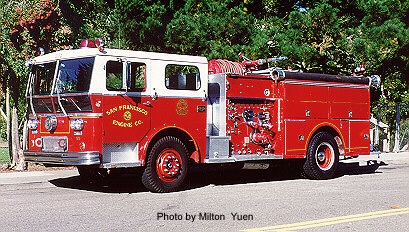 This was the "Ambassador" model available with 500 to 2000 GPM single or two stage Hale pumps. The original Ward LaFrance Truck Corporation ceased operation in 1979 due to major financial problems and was reformed under a new name, Ward79, that became defunct in 1989. 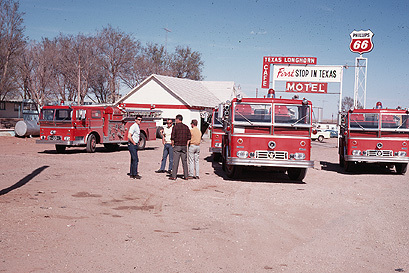 The Ward LaFrance Truck Corp. had no corporate connection with American LaFrance but did have a family connection. 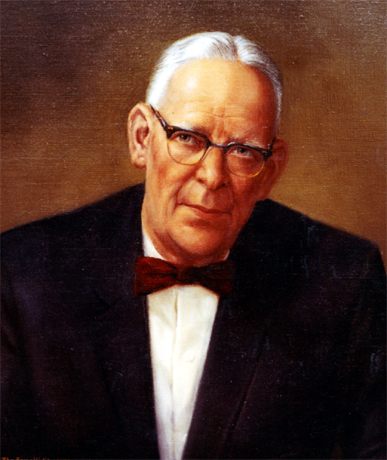 A.Ward LaFrance who founded the Ward LaFrance Truck Company was the son of Asa Willis LaFrance, who along with his brother Truxton Slocum LaFrance, founded the worlds largest and oldest fire apparatus company - AMERICAN LaFRANCE. 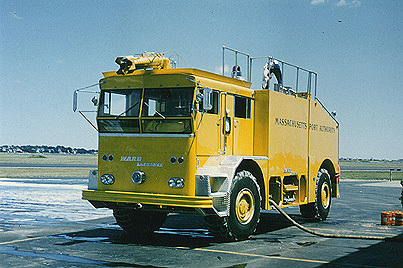 Ward LaFrance P-80 C.A.E triple combination pumper built for the Hempstead L.I. 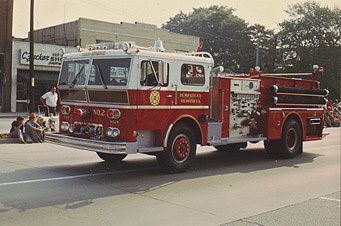 Volunteer Fire Department, Engine Company 2, is shown here on parade at the 1972 Hicksville, Long Island, parade and drill. 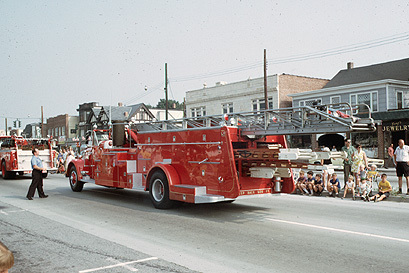 Ward LaFrance / Maxim model 85A-75, spec No.3903, is a 75ft aerial ladder truck owned by the Carle Place, Long Island Fire Department shown on parade at the 1972 Hicksville Long Island parade and drill. 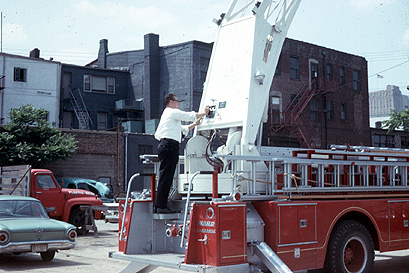 Ward LaFrance did not manufacture its own aerial ladder, so Ward LaFrance aerial ladder trucks used Maxim aerial ladders almost exclusively. Four new P-80 pumpers for the San Diego Fire Department shown here on the road in Texas and at the SDFD Kearny Mesa Training Center after being driven from the Ward LaFrance Factory in Elmira Hgts, NY to San Diego, California, a distance in excess of 3000 miles without incident by four San Diego firemen and Myself as relief driver. I believe the date was the Winter of 1966. 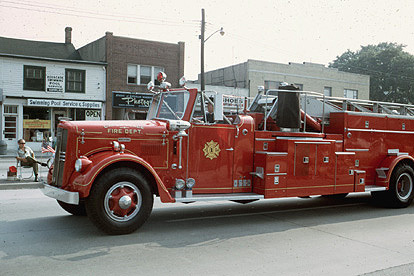 This was the Ward LaFrance model P-73 standard commercial chassis pumper. It was available on a Ford C.O.E C-700,C-800 or C-900 chassis. They were also available on other popular commercial truck chassis such as GMC, Chevrolet, Dodge, International. These were very popular with rural volunteer and smaller city fire departments. They were available with 500 gallon to 1500 gallon booster tanks and with 750 to 1250 GPM pumps depending on engine choice. 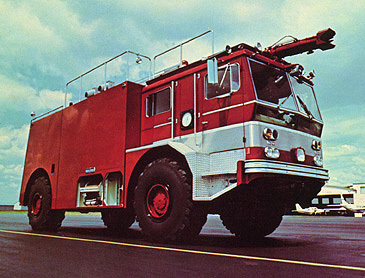 This was the largest fire fighting vehicle built by Ward LaFrance. Known as the "Statesman" model, it was designed as an airport crash-rescue truck. It carried 3000 gallons of water and 500 gallons of high expansion foam. 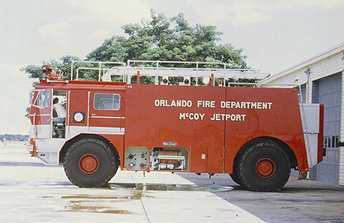 I delivered and put in service this one at the Orlando International Airport in Florida (at the time I delivered this truck, the airport was known as McCoy Jetport.) It is powered by twin Detroit V6-53 Diesels driving though MT640 Allison automatic transmissions into a Cotta transfer case. Max speed was in excess of 60mph. It had twin 1000 GPM single stage Hale pumps. I delivered a similar rig to the Logan International Airport in Boston that was powered by twin 534 CID Ford industrial gasoline engines. Cities that also purchased Ward LaFrance crash-rescue vehicles are Chicago, Dallas, Cleveland, Buffalo, Syracuse and Baltimore. Orlando Fire Department crash-rescue truck at the airport fire station. 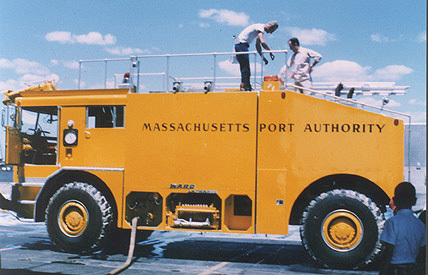 This is the crash-rescue truck I delivered and put in service at Boston's Logan International Airport. 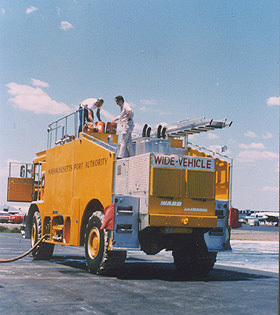 It is shown here undergoing foam tests at the airport fire station during delivery. 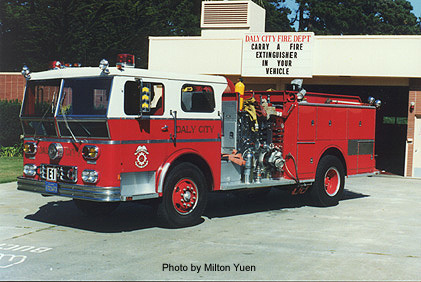 This truck had two 1000 GPM single stage Hale pumps each driven by a main engine through a full torque flywheel power take off which allowed the truck to pump and roll. 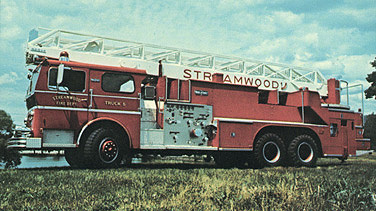 I delivered this Ward LaFrance tandem axle "Quint" to the Streamwood, Illinois Fire Department. It is powered by an 8V-71N Detroit Diesel engine and is equipped with a four section 100ft. rear mounted Grove aerial ladder and a 1500 GPM Hale pump This was one of the last delivery's I made in the East before being transferred to Los Angeles. 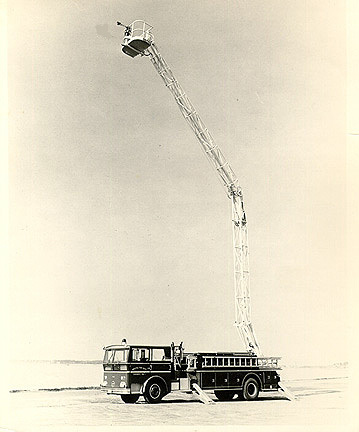 Ward LaFrance/Hi Ranger 85ft elevating platform. 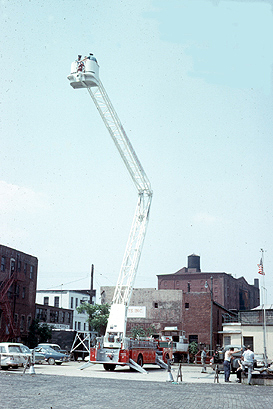 These units were built by Mobil Aerial Towers inc. in Fort Wayne, Indiana. Ward LaFrance sent the chassis sans bodywork to MAT for installation of the tower platform. Upon installation completion the rig returned to Elmira for bodywork and final painting. 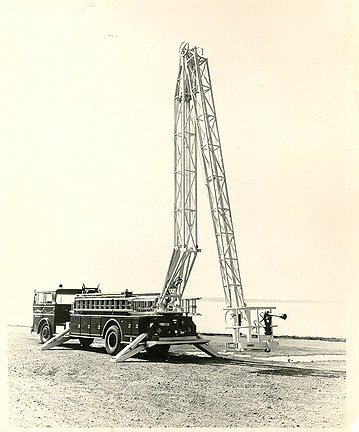 Although they were referred to as "Snorkels" by most firemen, they were not the same design as the original Pitman Snorkel that used a square tubular boom and a solid bar linkage system to level the platform while MAT used a lattice work boom and a cable leveling arrangement. 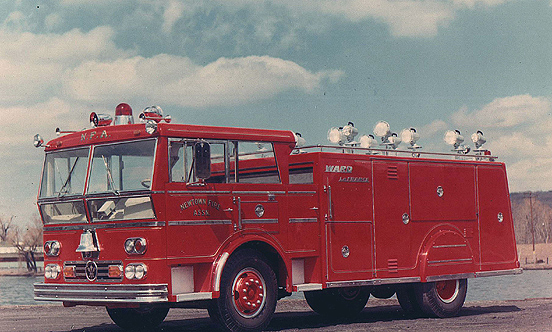 If my memory serves me correctly, the above pictured rig was delivered to the Bristol, R.I. Fire Department in 1962. The cab is the new "Mark 1" design which a little later with some slight changes became the "P-80" or "Ambassador" cab. These two photos were taken in 1965 during delivery training of the Newark, New Jersey Fire Department's new Ward LaFrance 85ft. elevating platform. The right photo shows NFD apparatus Chief Dan Torriello operating the basket overide controls. This rig was powered by a Waukesha FG-817 145GZB 6 cylinder gasoline engine driving through a spicer manual transmission. A PTO driven hydraulic pump provided the power to operate the booms. There was also a alternate hydraulic pump powered by a Wisconsin VE4-4 cylinder air cooled engine. This is the man that started it all. A. 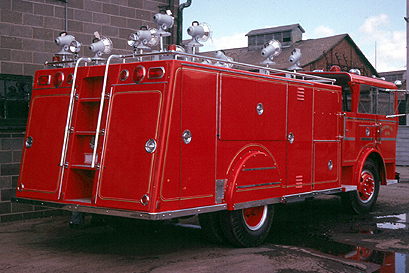 Ward LaFrance started his company back in 1918 as the Ward LaFrance Truck Co. building commercial trucks and by 1930 he began to build fire trucks as well. Later he took over the abandoned buildings of the defunct Force Field Pump Company at Grand Central Avenue and 11th street, in Elmira Heights, New York, manufacturing not only commercial heavy trucks and fire apparatus but chassis for busses and electric trolley coaches. 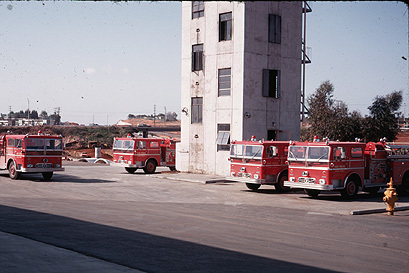 Due to lagging sales and stiff competition, commercial vehicle production was phased out in 1955 and all production consentrated on producing only fire apparatus and military equipment. Mr. LaFrance passed away in 1972 at the age of 87. I had the pleasure of meeting him a few times while I worked at the plant.